Chemokines, acting on their cognate receptors on infiltrating leukocytes, drive the inflammatory response. We have been interested in determining roles and potential mechanisms for the atypical chemokine-scavenging receptor D6 in the regulation of inflammation. In this study, we show that a psoriasis-like pathology that arises in inflamed skins of D6-deficient mice is characterized by a massive and aberrant localization of neutrophils to the dermal/epidermal junction, which is associated with development of the pathology. Such misplacement of neutrophils is also seen with D6-deficient mice in other inflammatory models, suggesting a role for D6 in the spatial positioning of neutrophils within inflamed sites. We further show that D6 functions cell autonomously in this context and that D6, expressed by neutrophils, limits their migrational responses to CCR1 ligands such as CCL3. Our data therefore indicate that D6 is able to play a cell-autonomous role as a migratory rheostat restricting migration of D6-expressing cells such as neutrophils toward ligands for coexpressed inflammatory chemokine receptors. These data have important implications for our understanding of the roles for D6 in regulating inflammation and for our understanding of the control of spatial positioning of leukocytes at inflamed sites. The movement of inflammatory leukocytes is controlled by members of the chemokine family (1), which is defined on the basis of chemotactic activity and the presence of a conserved cysteine motif in all members of the family. The family can be divided into four subfamilies (CC, CXC, XC, CX3C) according to the specific nature of the cysteine motif. There are almost 50 mammalian chemokines identified, and their biology is therefore complex. However, it is possible to impose a relatively simple 2-fold functional subdivision and to define chemokines as being either homeostatic, or inflammatory, according to the contexts in which they function (2, 3). Thus, homeostatic chemokines regulate basal leukocyte trafficking, whereas inflammatory chemokines regulate migration of leukocytes to inflamed or damaged sites. Chemokines interact with their target cells through seven-transmembrane spanning receptors (4), which again can be defined as being either homeostatic or inflammatory. In addition to the classical signaling chemokine receptors, there exists a small subfamily of atypical receptors characterized by promiscuity of ligand binding and an apparent inability to signal following ligand binding (5–7). This family includes the Duffy Ag receptor for chemokines, CCXCKR, CXCR7, and D6 (8, 9), which is the focus of this study. D6 is a promiscuous receptor for at least 12 CC-chemokines and has a binding preference for CC-chemokines that are involved in inflammatory responses (10–12). D6 does not bind CC-chemokines involved in homeostatic cellular migration or chemokines from the other subfamilies, and does not appear to signal following ligand binding. D6 is expressed predominantly in barrier tissues such as the skin, gut, lung, and placenta, and we, and others, have shown expression of D6 on lymphatic endothelial cells (13–15) and syncitiotrophoblasts (16, 17) at these sites. In addition, we have detected expression of D6 on leukocytes (18, 19). Notably, although D6 does not signal following ligand binding, it is not inert and actively internalizes ligands and targets them for intracellular degradation (11, 20). This has led us, and others, to propose a role for D6 as a scavenging receptor for inflammatory CC-chemokines. Numerous in vivo studies using D6-deficient mice have confirmed this scavenging role and have demonstrated an essential role, in vivo, for D6 in the resolution phase of cutaneous (21, 22), intestinal (23), and pulmonary (24) inflammatory responses and for the effective maintenance of pregnancy under systemic inflammatory conditions (16). Importantly, D6 has also been shown to play roles in a range of human inflammatory pathologies, including those of cutaneous (25, 26), respiratory (27), and cardiovascular (28) origin. 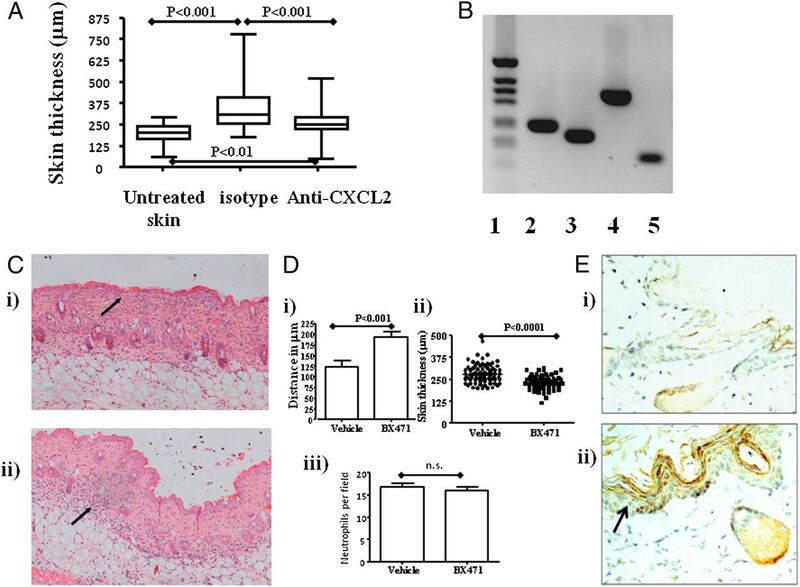 In addition, the enhanced inflammatory response in the D6-deficient mice is associated with an exaggerated tumorigenic program in murine models of skin (29) and intestinal (23) carcinogenesis. Finally, D6-deficient mice display an exaggerated systemic inflammatory response to infection by Mycobacterium tuberculosis (30). Our initial in vivo study (21) demonstrated that D6-deficient mice, in contrast to wild-type (WT) mice, were incapable of efficiently removing inflammatory CC-chemokines from 12-O-tetradecanoylphorbol-13-acetate (TPA)-treated skin, and the ensuing exaggerated inflammation precipitated the development of a psoriasis-like pathology. The purpose of the current study was to attempt to understand, in more detail, the involvement of D6 dysfunction in the emergence of this cutaneous pathology in the D6-deficient mice. In this study, we present evidence supporting a novel role for D6 in the cell-autonomous regulation of neutrophil migration during inflammatory responses. In the absence of D6, neutrophils displayed exaggerated migratory responses, in vitro and in vivo, to inflammatory CC-chemokines. This resulted in the inappropriate localization of neutrophils at the dermal/epidermal boundary and was associated with destruction of the dermal/epidermal barrier and epidermal shedding. Overall, our results suggest a novel role for D6 as a migratory rheostat limiting inappropriate intratissue movement of neutrophils during inflammatory responses. These results therefore shed new light on the range of roles played by D6 in the regulation of the inflammatory response. WT and D6-deficient mice were maintained, as described (21), and all animal experimentation was approved by our local ethical review committee and licensed by the United Kingdom Government Home Office. Cutaneous inflammation was initiated by application of either a single application, or three applications at 24-h intervals, of 150 μl 50 μM TPA (Sigma-Aldrich, Poole, U.K.) solution in acetone to shaved dorsal skin (21). The CCR1 blocker, BX471 (31), was administered orally (200 μl of a 25 mg/ml solution in 0.5% hydroxyethyl cellulose) three times per day for the duration of the mouse treatment. Vehicle control animals received 200 μl 0.5% hydroxyethyl cellulose. For the anti-CXCL2 experiments, 250 μg Ab (R&D Systems, Minneapolis, MN) or isotype control (rat IgG2B) in PBS was injected i.p., daily, throughout the study. Neutrophil depletion was performed by daily i.p. administration of 100 μg/mouse of the RB6-8C5 anti–Gr-1 or isotype control (rat IgG2b) Ab. Compound 48/80 (20 μl of a 10 mg/ml solution; Sigma-Aldrich) was injected intradermally on two sites either side of the dorsal midline of the mice. Following killing, the skins were removed from the mice and processed for routine H&E, or myeloperoxidase, staining, as described (21). Caspase-3 staining was performed using an anti-caspase 3 Ab from Santa Cruz Biotechnology (Heidelberg, Germany). Images were captured on a Zeiss Axiostar Plus microscope with Axiovision software (Carl Zeiss, Welwyn Garden City, U.K.). CCL3 in skin sections was visualized using anti-CCL3 Abs from R&D Systems. Skin thicknesses were measured at multiple sites per section using an eyepiece graticule. Analysis of neutrophil numbers was carried out by assessing the number of neutrophils in 10 random 12.5-μm2 fields per section. The relative proximity of neutrophil deposits to the dermal/epidermal junction was assessed by measuring the average distance between the base of the epidermal layer and the center of the neutrophil influx. Again, this analysis was performed using an eyepiece graticule. Neutrophils were obtained from murine bone marrow in a laminar flow hood and isolated (∼96% purity) by positive selection using a Ly6G isolation kit (Miltenyi Biotec, Surrey, U.K.). For CFSE and TAMRA labeling, neutrophils were resuspended in prewarmed PBS/0.1% BSA at a concentration of 1 × 106 cells/ml. CFSE (Invitrogen, Paisley, U.K.) was added to give a final concentration of 10 μM and incubated at 37°C for 10 min, and TAMRA (Invitrogen) was added to give a final concentration of 5 μM and incubated at 37°C for 20 min. Staining was quenched by adding 5 vol of ice-cold PBS and incubating on ice for 5 min. Cells were washed three times in ice-cold culture media, before resuspending at the appropriate concentration for adoptive transfer. Neutrophils were transferred to mice in which the skin had been inflamed with TPA 11 h earlier. Tissue was harvested from these mice 6 h later and processed for imaging of labeled neutrophils. The 5-mm punch biopsies were taken from treated mice and snap frozen in liquid nitrogen. The 4-μm sections were cut on a cryostat and mounted with Vectashield plus DAPI (Vector Labs, Peterborough, U.K.). Images were taken using the LSM510 META confocal laser-scanning microscope (Carl Zeiss), at original magnification ×20 for the whole length of the skin section. The distance from the epidermis to the position of each labeled cell was measured in micrometres, using AxioVision Rel. 4.6 software (Carl Zeiss). CCL3 (1 μg/mouse and 5 μg/mouse; R&D Systems) was injected into the peritoneal cavities of D6-deficient and WT mice (n = 3). PBS was used as a negative control. After 4 h, mice were sacrificed, peritoneal cavities were lavaged, and the number of neutrophils was determined from absolute and differential cell counts. Blood was drawn from WT and D6-deficient mice into heparinized tubes and peripheral blood neutrophils isolated using Polymorphoprep (Axis-Shield PoC AS, Oslo, Norway), according to the manufacturer’s instructions. Migration of the neutrophils to CCL2, CCL3, CCL4, CCL5, and CXCL8 was measured after incubation for 30 min at 37°C in a Boyden-type chamber using a 5 μm polyvinylidene difluoride filter. For two-way comparisons Student t test was used, and for more complex comparisons one-way ANOVA with Tukey's multiple comparison test were used. All statistical analyses were carried out using GraphPad Prism software. Although there are no differences in the resting skin of WT and D6-deficient mice (21), we have previously shown exaggerated cutaneous inflammation in D6-deficient mice (21) in response to three applications of TPA. This treatment led to the development of a psoriasis-like pathology in the D6-deficient mice that was not seen in similarly treated WT mice (Fig. 1A). 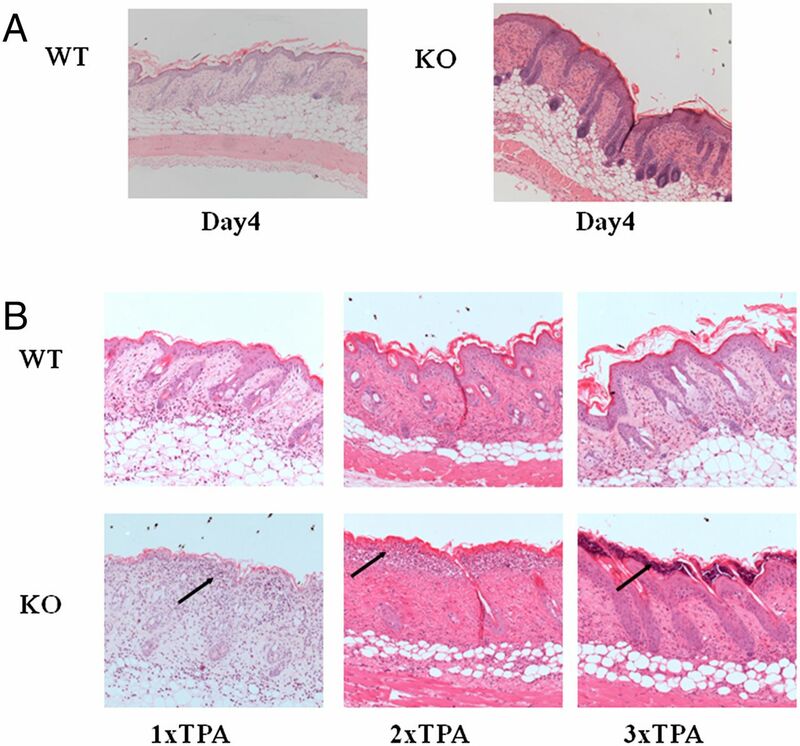 To investigate the cellular basis for the early development of this pathology, we examined the skins of WT and D6-deficient mice 24 h after one, two, and three daily applications of TPA. As shown in Fig. 1B, repeated application of TPA to WT skin induced a modest, but progressive increase in dermal and epidermal thickness, and inflammation, within the skin. In contrast, even after a single application of TPA, a marked accumulation of leukocytes was seen at the dermal/epidermal junction in the D6-deficient mice. After the second and third TPA application to D6-deficient mice, these leukocytes appeared to be associated with disruption of the dermal/epidermal junction and eventual shedding of the epidermis. Thus, enhanced inflammation seen in D6-deficient mouse skin is associated with leukocyte-mediated destruction of the dermal/epidermal junction. The psoriasis-like phenotype in D6-deficient mouse skin is associated with leukocyte-mediated destruction of the dermal/epidermal junction. 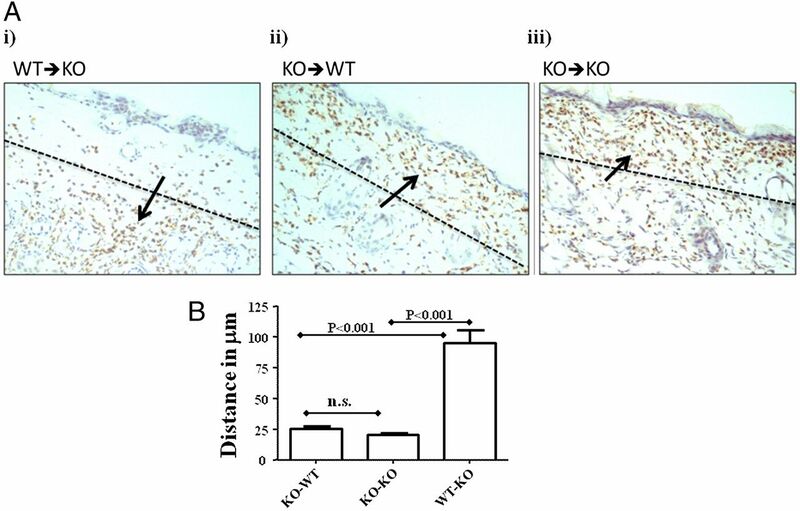 (A) H&E staining of skin from WT and D6-deficient (KO) mice 4 d after they have received three daily applications of TPA. Note the markedly thickened and inflamed skin in the KO section. Original magnification ×100. (B) H&E staining of skin sections from WT and D6-deficient (KO) mice at 24 h after one, two, and three TPA applications (leukocyte accumulations are arrowed). Original magnification ×200. The majority of the cells at the dermal/epidermal junction displayed the characteristic morphology of neutrophils (Fig. 2A). Their nature was confirmed by positive staining for myeloperoxidase, which further demonstrated neutrophil accumulation to be restricted predominantly to positions lower in the dermal compartment in WT mice, but to the dermal/epidemal junction in D6-deficient mice (Fig. 2B). Notably, treatment of the D6-deficient mice with the neutrophil-depleting Ab Gr1 resulted in significant attenuation of the development of the psoriasis-like pathology as assessed quantitatively by measurement of increased skin thickness (Fig. 2Ci). In addition, use of the anti-Gr1 Ab was associated with a marked decrease in neutrophil numbers in the blood (data not shown) as well as dramatically impaired neutrophil recruitment to the skin, thus confirming the success of the neutrophil depletion (Fig. 2Cii). Overall, these data demonstrate that the psoriasis-like pathology that develops in D6-deficient mice following TPA application is associated with, and dependent on, an aberrant accumulation of neutrophils at the dermal/epidermal junction. Neutrophils are the key cell type accumulating at the dermal/epidermal junction. (A) High-magnification image showing the neutrophilic morphology of cells (arrowed) accumulating at the dermal/epidermal junction. H&E stain. Original magnification ×400. (B) Myeloperoxidase staining revealing the neutrophilic nature (arrowed) of the misplaced leukocytes in D6-deficient (Bii) compared with WT (Bi) mouse skin. Original magnification ×200. (Ci) Extent of inflammation as reflected in skin thickness measurements in mice with, or without, Gr1-mediated in vivo neutrophil depletion. Control values refer to those obtained from untreated D6-deficient mouse skins; isotype values are from mice treated with the appropriate isotype control (rat IgG2b); and Gr1 values are from mice treated with the Gr1 Ab. Overall significance using ANOVA is p < 0.0001, and the specific significance of each comparison is noted on the figure. (Cii) Quantitation of the number of neutrophils in isotype control and Gr1-treated D6-deficient mouse skins. Neutrophils were measured as numbers per 12.5-μm2 field with 10 fields measured per mouse skin and 5 mice per group. (D) Skin sections were collected 24 h after a single application of TPA, and apoptosis was visualized by staining for caspase 3. Large numbers of apoptotic basal-layer keratinocytes are seen in the inflamed D6-deficient (KO) mouse skin (arrowed). Original magnification ×200. (E) Quantitation of the numbers of apoptotic (caspase 3+ve) cells in WT and KO epidermis at 18 and 24 h after TPA application. Counts are means ± SD from 10 sections with 20 counts per random field per section. For this comparison, ANOVA demonstrated overall significance of p < 0.0001, and the intergroup significance levels are noted on the figure. Closer analysis of the dermal/epidermal junction at the site of neutrophil accumulation revealed a disruption of the basement membrane (data not shown) in the TPA-treated D6-deficient mice. This was associated with an early increase in keratinocyte apoptosis that was detectable, using activated caspase-3 staining, as early as 18 h after the first application of TPA (Fig. 2D). Quantitation of caspase 3 staining showed that the extent of apoptosis in the basal keratinocyte layer increased between 18 and 24 h, a time frame that is associated with the disruption of the dermal/epidermal junction (Fig. 2E). Importantly, similar levels of apoptosis were not seen in WT mouse skin following TPA application (Fig. 2D, 2E). The positioning of the caspase 3–positive cells specifically along the basal layer of keratinocytes, and not deeper within the dermis, strongly suggests that they are keratinocytes and not neutrophils. Thus, the aberrant accumulation of neutrophils at the dermal/epidermal junction in D6-deficient mice is associated with induction of apoptosis among basal keratinocytes, destruction of the dermal epidermal boundary, and ultimately epidermal shedding (Fig. 1B). We next determined which chemokine receptors were responsible for this aberrant positioning of neutrophils in the inflamed skins from D6-deficient mice. Overall, as assessed by skin thickness measurements, the psoriasis-like pathology is significantly dependent on the neutrophil-attracting chemokine CXCL2 (Fig. 3A), but CXCL2 is not a ligand for D6, suggesting that whereas CXCL2 may regulate neutrophil entry into inflamed skin, other chemokines and their receptors may separately regulate the spatial positioning of neutrophils within the skin. Therefore, we used PCR to investigate expression of other chemokine receptors in WT murine neutrophils (Fig. 3B). This analysis revealed expression of the major neutrophil chemokine receptor, CXCR2, in neutrophils and, in accord with other reports, also showed expression of CCR1 (32, 33). Interestingly, and in agreement with previous findings (18), the WT mouse-derived neutrophils were also positive for D6. Therefore, to investigate roles for CCR1 ligands in the aberrant positioning of the neutrophils in D6-deficient mice, we examined the neutrophil positioning in inflamed skins of D6-deficient mice treated with a well-characterized antagonist of CCR1 (31). As shown in Fig. 3C, administration of this CCR1 antagonist effectively reversed the aberrant accumulation of neutrophils in D6-deficient mouse skins in response to TPA challenge. This was quantified by measuring the distance between the base of the epidermis and the center of the neutrophil deposits. This analysis demonstrated that the antagonist was associated with a significant reduction in neutrophil accumulation at the dermal/epidermal border (Fig. 3Di). In addition, the reduction in neutrophil accumulation at this site was associated with a related decrease in skin thickness (a useful surrogate measure of inflammation), confirming a role for neutrophil positioning in the exaggerated skin inflammation in D6-deficient mice (Fig. 3Dii). Importantly, there was no significant impact of the CCR1 antagonist on neutrophil accumulation (Fig. 3Diii), suggesting that the antagonist alters neutrophil positioning, but not recruitment to the inflamed skin. Next, we investigated the reasons underlying the specific CCR1-dependent accumulation of the D6-deficient neutrophils at the dermal/epidermal boundary. Using immunohistochemistry, we showed that, following TPA application, the major site of production of CCR1-binding inflammatory CC-chemokines such as CCL3 (Fig. 3E) is the epidermal compartment. Thus, these data suggest that, in D6-deficient mice, CCR1 is important for the directed migration of neutrophils through the dermis toward inflammatory CC-chemokines produced within the epidermis. The aberrant neutrophil positioning is CCR1 dependent. (A) D6-deficient mice were either left untreated or were treated three times with TPA and left for 4 d for the psoriatic phenotype to develop, as described. TPA-treated D6-deficient mice were administered Abs to either CXCL2 or isotype control Abs. Skin thickness as a measure of inflammation was assessed in 10 sections per point with 20 measurements per section. ANOVA indicated p < 0.0001 for the complete data set, and intergroup significance levels are noted on the figure. (B) PCR analysis of expression of (lane 2) CCR1, (lane 3) CXCR2, (lane 4) D6, and (lane 5) actin in neutrophils isolated by positive selection. (Lane 1) The m.w. marker track. (C) The effects of the CCR1 blocker BX471 on the positioning of neutrophils in the inflamed D6-deficient mouse skin. Mice were treated i.p. with either (Ci) vehicle or (Cii) BX471, and then TPA was applied to the skin. Skins were collected 24 h later and H&E stained (neutrophils are arrowed). Original magnification ×200. (D) Quantitation of the effects of CCR1 blockade on (Di) neutrophil positioning. These results report the average distances from the bottom of the epidermis to the center of the neutrophil deposits in the skins of the vehicle- or BX471-treated D6-deficient mice. (Dii) Skin thickness as an index of inflammation; (Diii) number of neutrophils per 12.5-μm2 field with 10 fields measured per mouse skin and 5 mice per group. (E) Immunostaining for CCL3 expression reveals the epidermis to be the major site of expression following TPA-induced inflammation. D6-deficient mice were topically treated with acetone (Ei), or with TPA (Eii), for 24 h, and then skins were collected and stained for CCL3 expression. Original magnification ×400. To examine roles for D6 in regulating neutrophil positioning in other models of D6-deficient cutaneous inflammatory responses, we intradermally injected, into resting WT and D6-deficient mice, compound 48/80, which induces mast cell degranulation. Strikingly, this compound was associated with severe tissue damage at the site of injection in D6-deficient mice, but a lesser response was seen in WT mice (Fig. 4A). Examination of the cells accumulating at the site of tissue damage again revealed them to be predominantly neutrophilic in nature (data not shown), suggesting that the inflammation associated with mast cell degranulation leads to recruitment of neutrophils that are again aberrantly positioned in D6-deficient mice, leading to extensive damage at the dermal/epidermal junction of the treated skin. In contrast to the TPA-induced inflammation model, the tissue damage associated with compound 48/80 was so severe that objective measurement of neutrophil numbers or position was not possible. Nevertheless, such severe tissue damage was seen in all compound 48/80–treated D6-deficient, but not WT, mice. 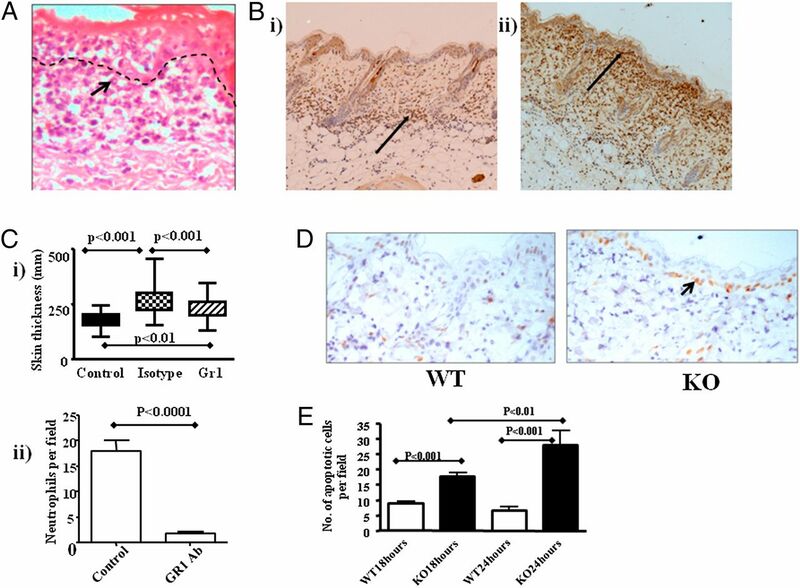 Thus, the contribution of aberrantly positioned neutrophils to tissue damage is not restricted to the TPA painting model of skin inflammation. Aberrant neutrophil accumulation is also seen in other inflammatory models. (A) Mice were administered compound 48/80 (20 μl 10 mg/ml) intradermally, mice were killed, and skins were collected 24 h later. Skin sections were stained with H&E and the neutrophil-associated damage is arrowed. Original magnification ×200. (B) Mice were injected i.p. with CCL3 at the indicated concentrations, and recruited neutrophils were counted 24 h later. Next, we examined neutrophil accumulation following i.p. injection of the D6 ligand CCL3 in WT and D6-deficient mice. As shown in Fig. 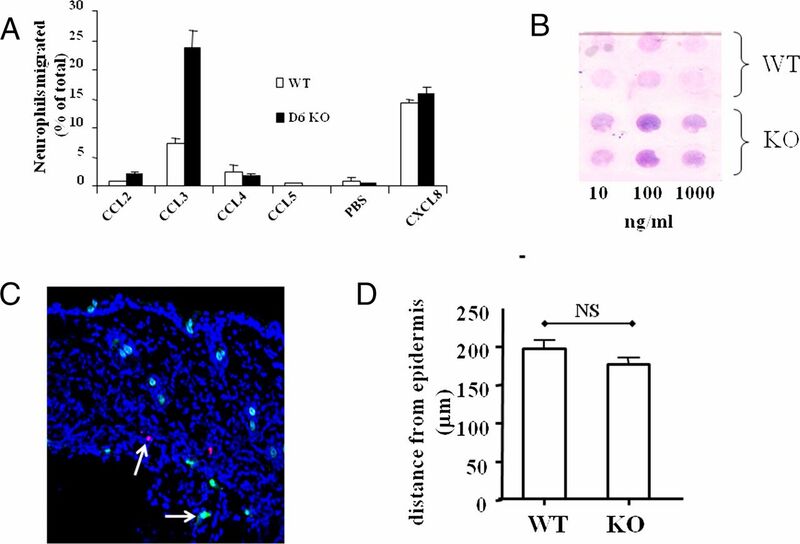 4B, administration of 1 μg CCL3 induced a significantly higher accumulation of neutrophils in the peritoneal cavity of D6-deficient mice than was seen in WT mice. Interestingly, higher levels of CCL3 induced similar levels of neutrophil accumulation in WT and D6-deficient mouse peritoneum, suggesting that the negative impact of D6 on neutrophil accumulation in WT mice can be overcome under conditions of high chemokine exposure. Thus, together, these data show that the limiting effects of D6 on neutrophil accumulation are not restricted to the TPA skin-painting model and can be overcome under conditions of exaggerated chemokine exposure. Based on the above observations, there are two possible explanations for the aberrant positioning of neutrophils in D6-deficient mice. First, the inability to effectively clear chemokines in D6-deficient mice (14, 15) may leave excess chemokines in the vicinity of the dermal/epidermal junction that may chemoattract neutrophils via CCR1. Alternatively, as we have shown D6 expression in neutrophils (Fig. 3B), it is possible, as also suggested by the in vitro studies of Bonecchi et al. (10), that D6 regulates leukocyte migration toward inflammatory CC-chemokines on a cell-autonomous basis by interfering with CCR1 function. To test whether the aberrant localization of neutrophils related to hemopoietic or nonhemopoietic D6 expression, we generated radiation chimeras. As shown in Fig. 5A, D6-deficient mice, in receipt of WT bone marrow (Fig. 5Ai), did not display accumulation of neutrophils at the dermal/epidermal junction. In contrast, WT mice receiving D6-deficient bone marrow did (Fig. 5Aii). As a control, we also generated chimeras in which D6-deficient mice received D6-deficient bone marrow, and in these mice there was also mislocalization of neutrophils at the dermal/epidermal junction (Fig. 5Aiii). Neurophil mislocalization was quantified by measuring the distance from the base of the epidermis to the center of the neutrophil infiltrate. As shown in Fig. 5B, this analysis demonstrated a significantly enhanced ability of D6-deficient neutrophils to migrate to the dermal/epidermal boundary (reduced distance measure in Fig. 5B) compared with WT neutrophils (increased distance measure in Fig. 5B). These data therefore show that D6 regulation of neutrophil positioning in inflamed skin is dependent on hematopoietic expression of D6 and, along with the data in Fig. 3B, suggest that D6 may regulate neutrophil migration in a cell-autonomous manner. To investigate this directly, we examined the response of WT and D6-deficient neutrophils to a range of chemokine ligands in Boyden chamber assays. As shown in Fig. 6A, there were no differences in the migration of WT or D6-deficient neutrophils toward the CXCR2 ligand CXCL8 or to the CCR5-specific ligand CCL4. However, there was a marked difference in the ability of WT and D6-deficient neutrophils to migrate toward the CCR1 and CCR5 interacting ligand CCL3 with D6-deficient neutrophils, displaying a significantly more marked migration toward this chemokine. Unusually, we only managed to demonstrate weak migratory responses of the neutrophils to another CCR1 ligand, CCL5, and at present we have no explanation for this observation. As shown in the stained filter from a Boyden chamber assay (Fig. 6B), the enhanced migration of D6-deficient neutrophils is seen over a range of concentrations of CCL3. These data suggest that D6 functions, in a cell-autonomous manner, to limit migration of neutrophils toward CCR1 ligands and that the absence of D6 in D6-deficient mice allows unrestricted movement of the neutrophils specifically toward sources of CCL3. D6 exerts a cell-autonomous effect on neutrophil migration. (A) Histological analysis of neutrophil migration in radiation chimeric mice. Neutrophil accumulation is detected by staining for myeloperoxidase and marked by the arrows. (Ai) WT donor and D6-deficient (KO) recipient mice; (Aii) D6-deficient donors and WT recipient mice; (Aiii) D6-deficient recipient and D6-deficient donor mice. Original magnification ×200. (B) Quantitation of the distance from the base of the epidermal layer to the center of the neutrophil influx. For each experimental group, 10 separate measurements for each skin sample were made from 5 separate mice. D6-deficient neutrophils display enhanced responses to CCL3. (A) D6-deficient (KO) neutrophils display an exaggerated migration toward CCL3 in Boyden chamber assays. (B) Giemsa-stained filter from a Boyden chamber assay showing differential responses of D6-deficient and WT neutrophils to a range of CCL3 concentrations. Original magnification ×10. (C) Confocal imaging of frozen skin sections from mice to which WT (CMTMR-labeled) and KO (CFSE-labeled) neutrophils (indicated by arrows) had been transferred, and then skins were inflamed by TPA treatment. Original magnification ×200. The indicated cells were fluorescently labeled as described in the Materials and Methods and the tissues stained with DAPI to identify nuclei. (D) Quantitation of the distance of neutrophil entry from the epidermis assessed by measuring the distance from the base of the epidermal layer to the point of neutrophil entry. To formally rule out the possibility that the accumulation of neutrophils in D6-deficient mice relates to entry of the D6-deficient neutrophils at higher positions within the dermis than WT neutrophils, we separately dye labeled WT and D6-deficient neutrophils and adoptively transferred them into D6-deficient mice that had been treated with TPA. As shown in Fig. 6C, confocal imaging revealed similar spatial positioning of the WT and D6-deficient neutrophils soon after transfer. Quantification revealed (Fig. 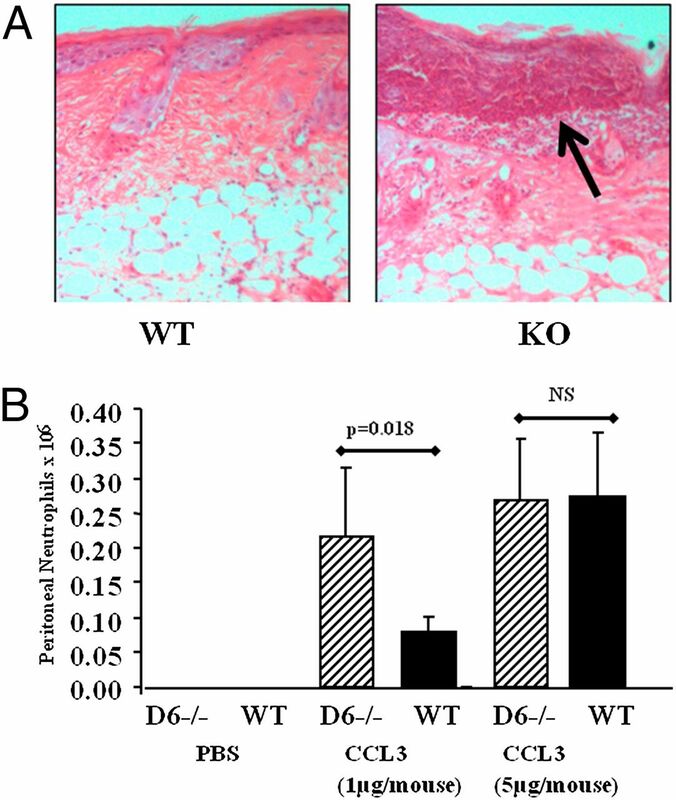 6D) that there were no significant differences in the levels of entry (i.e., distance from the base of the epidermis) of WT and D6-deficient neutrophils in the dermis of the D6-deficient mice. It is important to note that whereas the preceding data would suggest that the D6-deficient neutrophils in this experiment might have been expected to have migrated higher within the dermis than their WT counterparts, these cells are most likely at the end of their lifespan given the time taken to harvest them and to perform this homing assay. We suggest, therefore, that by the time the neutrophils enter the skin, they are likely to be unresponsive to further chemokine stimulation. However, we cannot formally exclude the possibility that, in this experimental context, a contribution of D6 expression on other hematopoietic cells may have had an unanticipated effect on the intracutaneous movement of the D6-deficient neutrophils. Thus, together, the majority of our data point to a cell-autonomous role for D6 in regulating neutrophil movement and in restricting the accumulation of neutrophils at the dermal/epidermal junction in WT mice. In contrast, the D6-deficient neutrophils do not have this restriction and so migrate more freely toward the epidermally expressed chemokines. The chemokine-scavenging receptor, D6, has been shown to be an important regulator of the in vivo inflammatory response (8). We have now analyzed the early stages of the involvement of D6 in the generation of the psoriasis-like pathology seen in the skins of D6-deficient mice following TPA treatment. Our data indicate that, in addition to scavenging chemokines within the inflamed skins, D6 is also involved in controlling the spatial positioning of neutrophils within inflamed sites. As we have previously shown mast cells to also be misplaced toward the dermal/epidermal junction in the D6-deficient mice (21), this role for D6 may not be restricted to neutrophils. The importance of regulating the spatial distribution of cells such as neutrophils and mast cells within tissues that represent barriers between the organism and the outside world is apparent from the extensive damage that such cells can cause. Indeed, a number of pathologies result from tissue destruction arising as a consequence of aberrantly accumulating neutrophils at a range of distinct anatomical sites (34, 35). The mechanism behind this aberrant accumulation of neutrophils depends on expression of both D6 and CCR1 by neutrophils. Numerous previous studies have reported expression of CCR1 by both murine (33, 36) and human (36–38) neutrophils, and the present results would indicate that this is an important regulator of positioning within inflamed tissues. One question that emerges from this is why neutrophils coexpress CCR1 and D6 if D6 blocks CCR1 function. Why not simply transcriptionally silence CCR1? Interestingly, we have noticed that the restricted motility of neutrophils coexpressing D6 and CCR1 can be overcome by exposure to high levels of chemokines (e.g., Fig. 4B). We therefore propose that D6 is not a full suppresser of CCR1 responses in neutrophils, but that it serves as a rheostat controlling the movement of neutrophils toward inflammatory events at the dermal/epidermal interface. Under conditions of extreme tissue damage in which shedding of the damaged epidermis may be advantageous (e.g., in the context of significant epidermal infection), the rheostat function of D6 is overcome, allowing neutrophils (and potentially mast cells) to move to the dermal/epidermal interface and to induce shedding of the damaged epidermis and subsequent tissue regeneration. Our present data, and our proposal for a role for D6 as a migratory rheostat, are in keeping with the in vitro data reported by Bonecchi et al. (10), demonstrating the ability of D6 to dominantly suppress migration of cells to ligands for coexpressed CCR4. Thus, the cell-autonomous effects of D6 are unlikely to be specific for CCR1 and are likely to be seen with any of the coexpressed receptors for inflammatory CC-chemokines. Therefore, in summary, our data indicate a role for the atypical chemokine receptor, D6, in the regulation of cellular migration in vivo. Accordingly, these data broaden our understanding of the in vivo roles for D6 and suggest that, as well as being a scavenger of inflammatory CC-chemokines, D6 may also act as a cell-autonomous migratory rheostat for leukocytes. The primary aim of this may be to protect crucial barrier tissues from the unnecessary toxic effects of neutrophil and mast cell contents. The help of Lisa Thorpe with the Boyden chamber assays is gratefully acknowledged. This work was supported by grants from the Medical Research Council, Cancer Research UK, and Biotechnology and Biological Sciences Research Council (to G.J.G. ), and from INNOCHEM (to G.J.G. and A.R.).
. 2003. Chemokines on the move: control by the chemokine “interceptors” Duffy blood group antigen and D6. Semin. Immunol. 15: 287–294.
. 2013. Regulation of the immune and inflammatory responses by the ‘atypical’ chemokine receptor D6. J. Pathol. 229: 168–175.
. 2011. Atypical chemokine receptors. Exp. Cell Res. 317: 556–568.
. 2004. Differential recognition and scavenging of native and truncated macrophage-derived chemokine (macrophage-derived chemokine/CC chemokine ligand 22) by the D6 decoy receptor. J. Immunol. 172: 4972–4976.
. 2003. Cutting edge: scavenging of inflammatory CC chemokines by the promiscuous putatively silent chemokine receptor D6. J. Immunol. 170: 2279–2282.
. 2001. The beta-chemokine receptor D6 is expressed by lymphatic endothelium and a subset of vascular tumors. Am. J. Pathol. 158: 867–877.
. 2011. D6 facilitates cellular migration and fluid flow to lymph nodes by suppressing lymphatic congestion. Blood 118: 6220–6229.
. 2013. D6: the ‘crowd controller’ at the immune gateway. Trends Immunol. 34: 7–12.
. 2007. Protection against inflammation- and autoantibody-caused fetal loss by the chemokine decoy receptor D6. Proc. Natl. Acad. Sci. USA 104: 2319–2324.
. 2010. Chemokine scavenger D6 is expressed by trophoblasts and aids the survival of mouse embryos transferred into allogeneic recipients. J. Immunol. 184: 3202–3212.
. 2008. Hemopoietic cell expression of the chemokine decoy receptor D6 is dynamic and regulated by GATA1. J. Immunol. 181: 3353–3363.
. 2005. Increased inflammation in mice deficient for the chemokine decoy receptor D6. Eur. J. Immunol. 35: 1342–1346.
. 2010. The lymphatic system controls intestinal inflammation and inflammation-associated colon cancer through the chemokine decoy receptor D6. Gut 59: 197–206.
. 2007. The chemokine receptor D6 has opposing effects on allergic inflammation and airway reactivity. Am. J. Respir. Crit. Care Med. 175: 243–249.
. 2011. An investigation of the inflammatory cytokine and chemokine network in systemic sclerosis. Ann. Rheum. Dis. 70: 1115–1121.
. 2012. Elevated expression of the chemokine-scavenging receptor D6 is associated with impaired lesion development in psoriasis. Am. J. Pathol. 181: 1158–1164.
. 2013. Expression of the atypical chemokine receptor D6 in human alveolar macrophages in COPD. Chest 143: 98–106.
. 2012. The chemokine decoy receptor D6 prevents excessive inflammation and adverse ventricular remodeling after myocardial infarction. Arterioscler. Thromb. Vasc. Biol. 32: 2206–2213.
. 2007. The atypical chemokine receptor D6 suppresses the development of chemically induced skin tumors. J. Clin. Invest. 117: 1884–1892.
. 2008. Role of the chemokine decoy receptor D6 in balancing inflammation, immune activation, and antimicrobial resistance in Mycobacterium tuberculosis infection. J. Exp. Med. 205: 2075–2084. 2005. BX471: a CCR1 antagonist with anti-inflammatory activity in man. Mini Rev. Med. Chem. 5: 791–804.
. 1999. Chronic inflammation upregulates chemokine receptors and induces neutrophil migration to monocyte chemoattractant protein-1. J. Clin. Invest. 103: 1269–1276.
. 2004. Novel chemokine responsiveness and mobilization of neutrophils during sepsis. Am. J. Pathol. 165: 2187–2196. 2002. Neutrophilic dermatoses. Dermatol. Clin. 20: 409–419.
. 2006. Neutrophilic dermatoses. Clin. Dermatol. 24: 470–481.
. 2000. Cutaneous injection of human subjects with macrophage inflammatory protein-1 alpha induces significant recruitment of neutrophils and monocytes. J. Immunol. 164: 3392–3401.
. 2001. Diverging binding capacities of natural LD78beta isoforms of macrophage inflammatory protein-1alpha to the CC chemokine receptors 1, 3 and 5 affect their anti-HIV-1 activity and chemotactic potencies for neutrophils and eosinophils. Eur. J. Immunol. 31: 2170–2178.